When it comes to time-tested durability and excellence, oak doors stand alone atop the pack. Used since the Middle Ages in Europe for the construction of doors and interior panels for cathedrals, government buildings, and estates, oak is renowned for its great strength and resistance to insects and molds. For hundreds of years oak was the wood of choice for shipbuilding. Oak doors are loved for their warm grain and rich colors. et at the back of this colonial gallery of tall, fluted columns and ornamental moldings, this multi-panel, double door with period hardware is an astonishing work of art. 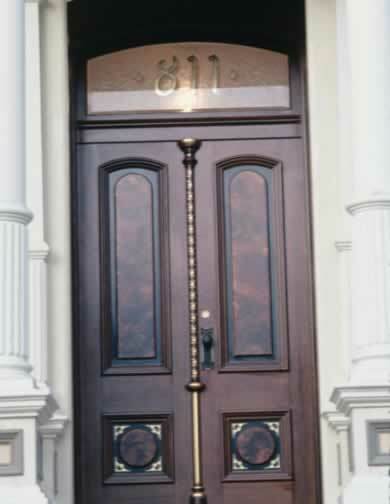 The transom with frosted glass and period lettering completes the formal look of the period. Modern hardware upgrades the security features of this traditional oak door.